Feel like trying out your luck? You deserve to have a fun day at the bingo with your friends. Bingo is such a popular game with older people but you’d be surprised how many people play the game Bingo Blitz on Facebook. It is literally the #1 gambling game on Facebook and the company that owns the bingo game makes tens of millions of dollars yearly. So bingo is quite the profitable game. 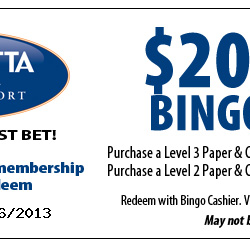 With this Printable Coushatta Casino Resort Bingo Coupon you can get $20 off bingo play at Coushatta Casino Resort! Have fun and save your money!